In April, 1976, the Treasury Department reintroduced the $2 bill as a cost-saving measure. 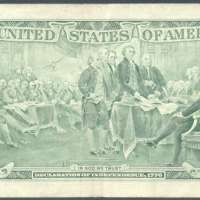 Series 1976 $2 bills were redesigned and issued as a Federal Reserve Note. The obverse remains basically unchanged since 1929 and features the same portrait of Jefferson. A green treasury seal and serial numbers replace the red used on the previous United States Notes. Since the reissue of the bill coincided with the United States Bicentennial, it was decided to use a bicentennial themed design on the reverse. An engraved rendition of John Trumbull's The Declaration of Independence replaced Monticello on the reverse. First day issues of the new $2 bills could be taken to a post office and stamped with the date "APR 13 1976". In all, 590,720,000 notes from Series 1976 were printed. This banknote was received as a change at Siem Reap Night Market on 22 February 2013. It was marked with rubber stamp on the middle-left on the obverse side of the banknote. HEY! WHAT’S THE DEAL WITH SPENDTOM? What the heck is a Tom and why should I care? Here’s the scoop. SpendTom is an interactive public awareness campaign where consumers like you demonstrate the economic impact of tourism while earning the chance to win prizes. The California Travel and Tourism Commission is working with popular destinations across the state to circulate thousands of $2 bills – featuring Thomas Jefferson’s famous mug – during National Tourism Week May 8-16, 2010 through the end of May. 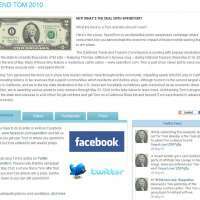 Many of these bills feature a mysterious call to action – www.spendtom.com. This is part of our clever plot to send you on a search for these unusual bills – and spend them!! By helping Tom get around the block you’ll show how tourism dollars move throughout the community, impacting nearly 900,000 jobs in California and generating billions in tax revenues that support communities which residents and visitors enjoy. Although tourism is the second largest export industry in California, and we’re the top state destination in the U.S., travel and hospitality sometimes gets overlooked as an economic driver. To make it fun, we’re awarding various prizes to lucky winners through May 31. Click on the tabs below to learn more. And tracking Tom’s progress across the state and overseas is a lot of fun! So get out there and get Tom on a California Road trip and beyond (Tom says thanks in advance – he needs a vacay! ).